Gather a variety of fruits and vegetables. Try to collect some familiar kinds (like apples, oranges, bananas, carrots, celery and brussels sprouts) and some that children might not have seen before. Papayas, figs, passion fruit, artichokes, pomegranates, eggplant and different kinds of beans and peas are really interesting on the inside and will be fun to dissect. If you have any markets that sell fruits and vegetables that children may be unfamiliar with because they are more common in other cultures, using these foods can provide a great opportunity to introduce them to those cultures, especially if students in your afterschool represent some of the countries those foods came from. Wash all of the fruits and vegetables ahead of time. Ask your students to name some fruits and vegetables that they know. Record this list on a piece of chart paper or a chalkboard. What do they think is the difference between a fruit and a vegetable? Show them the food that you have collected. Do all of them look familiar to your students? If there are any that they have not seen before, tell them what they are called and where you purchased them. Take a closer look at these fruits and vegetables! Divide your class into teams of 2–3 for this activity. Distribute magnifying lenses to each team. Ask students to carefully wash their hands before handling the food – we might want to eat it later! Distribute a few fruits and vegetables to each team. Each team does not need to have the same variety of foods to investigate. Ask each team to observe the shape, color and aroma of their fruits. Can you tell where the fruit attached to the branch? Can you tell whether the vegetable grew above or below the ground? Look closely at the outer skin. Look more closely with a magnifying lens. What do you notice? Is there anything you wonder about? Write down anything you notice about the fruits and vegetables you are examining. Ask teams to separate their foods into 3 groups—fruits, vegetables and a group for anything they’re not sure about. After 5–10 minutes, when each team has examined their items and divided them into “fruits”, “veggies” and “I’m not sure” groups, bring them together to talk about what they observed. Have each team share with the rest of the group something interesting they noticed about 1 or 2 items. Then ask the teams how they decided which foods were fruits, which foods were vegetables and which ones they weren’t sure about. Can the whole class agree on some “rules” for deciding which is which? How might they examine their items even further? Some students might suggest cutting the foods open to look at the inside. Tell them that you will go from team to team and cut open their foods so that they can more closely examine them and learn a little more. Move from team to team with the knife and cut all of the foods that the teams have labeled “fruits” in half. Try to cut most of the fruits lengthwise. Ask teams to again examine and observe, writing down anything that they notice. Does the fruit have seeds? Where are they? Do you notice any patterns in the fruit? Does the fruit get peeled before eating it? What do you notice about the peel? What could you do with the peel or with the seeds? Next, ask teams to examine the vegetables. What part of the whole plant do you think they were? Move from team to team and cut the veggies in half and in pieces so that students can study them more closely. 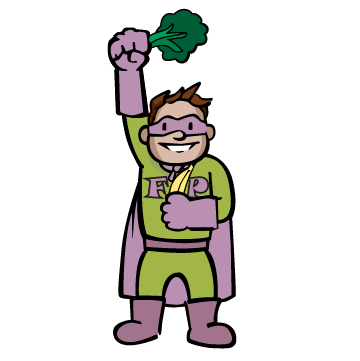 Save the cut up fruit and vegetables to use in the Food Power – Design a Dip activity, or eat them right away! Save the seeds from any of the foods you dissected—you can plant them later and grow your own fruits and vegetables (see below)! Scientists classify a fruit as the part of a plant that covers the seeds. This is why some foods that we think of as vegetables (like tomatoes, pumpkin, squash, cucumbers, green beans, eggplants and bell peppers) are actually fruits (have you seen the seeds inside these foods?). The term “vegetable” is a term only used when talking about food we eat, so scientists do not classify anything as a “vegetable”. That’s why in cooking, the word “vegetable” refers to the parts of plants that we eat other than the fruit. This includes stems, leaves, roots, flowers, bulbs, seeds and even fungi like mushrooms. In cooking, “fruits” are anything sweet and vegetables are anything that is not so sweet—this is why tomatoes, squash, cucumbers, eggplant, green beans, peppers, etc. are classified as “vegetables” instead of “fruits” when you are talking about cooking. So, if you are asked the question “Is a cucumber, or a pumpkin, etc. a fruit or a vegetable”, the answer is—both! It depends on whether you are talking scientifically or about cooking. Rhubarb is an example of a food that is usually called a fruit, but it has no seeds—it is the stalk of a plant, so scientifically speaking, it is not a fruit. Planting Seeds: Once kids have located the seeds in their fruits, have them plant some samples in a small amount of planting soil or a peat pellet in a container such as a prepared plastic egg carton. Invite them to put 2 or 3 seeds from each fruit into a bit of soil. (Avoid putting in too many because if all the seeds germinate in 1 small space you will need to thin them.) With regular care (water and sun or grow lights) the seeds will germinate. You may need to transplant them after a few weeks. If you live in an area that has cold winters, many of the fruit plants may not get beyond the seedling stage, but others, such as tomatoes and peppers may succeed as mature plants. However long they last, it is still interesting to show how food can produce a seedling that would eventually produce more food. Plant each seed (or 2 or 3 seeds) in its own little cup, tucked into a soaked peat pellet or into a spoonful of planting soil mix, covered by ¼”—½” of soil. If you use a plastic carton with a lid, close the lid over the seedlings to keep moisture in. If too much moisture accumulates, open the lid a bit to let some out. In 2 or 3 weeks they will outgrow this cozy space, but they will have had a good start. Alternatively, you can cover paper or plastic cups with plastic wrap to achieve a similar “hot house” for the seedlings. This will help a great deal to keep the soil from drying out.